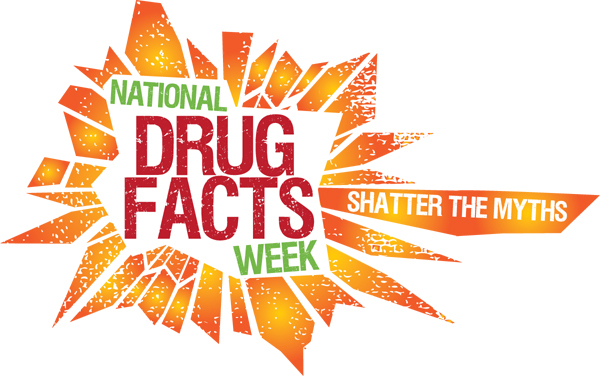 The National Institute on Drug Abuse is holding the 3rdAnnual National Drug Facts Week from January 28 – February 3, 2013. Taking part in National Drug Facts Week means you have the opportunity to help shatter the myths about drug use for teens. Every day, teens are bombarded with conflicting messages that may leave them feeling confused and unsure of who to ask for information about drug use. With 7.4% of teens reporting abuse of prescription drugs in the past year and 22.6% of 12th graders reporting using marijuana in the past month, it’s crucial to reach teens with the facts. As the mother of two teens, these numbers frighten me. As a social worker addressing the prevention of abuse of all substances, these numbers frighten me. As a neighbor, community activist and citizen, these numbers frighten me. I think the best resource we have is each other. It is incumbent on us to share the facts as we know them and to encourage others to understand why abusing and misusing alcohol, illicit drugs, and prescription drugs is so dangerous. Teens are known for their naive inability to think beyond the now. We know this; we were all teens once, too. So, how do we get them to think years and decades ahead? For me, the scare tactics worked. That whole, “This is your brain on drugs”. But, also I knew my parents would be disappointed in me and that would have crushed me. I knew this because they talked with me, especially my Dad. He, too, was a social worker and understood how to approach me differently than my two sisters. So now, I am adapting what worked for me when I talk with my sons. My husband, who is also a social worker, obviously had different experiences and approaches our boys as a Dad and as a man. We have to work together to make sure our messages are consistent and not contradictory. The last thing we want is to confuse them further or have them think we are not on the same page. Think about what would have helped you more when you were a teen. Do you talk with your own children or your friends? How do they respond? Does your family and community take proactive and positive stances to reduce drug issues? What approach worked for you? What is effective in your community?